All right, so I’m sure you’re sick of me by now. Seems like my blog has been suffering from extremely serious “when it rains, it pours” issues. But recipes don’t count, right? That wasn’t blogging. That was simply updating my recipe page. . . Anyway. NaNoWriMo starts tonight at midnight, and I’ve been too excited to sit at my computer and work on setting up my Scrivener document. And I am in no way a neat freak, but I can’t write when my apartment is messy, so I’ve been cleaning. But I just abandoned my clothing organization endeavor for the sake of all of you, my lucky reader. Because I’ve survived and won NaNo one whole time, and that makes me a wealth of information, don’t you think? So here it is. My first post on NaNo survival. And yes, this is kind of embarrassing, but here’s a picture of what I’ll be wearing while NaNoIng. Except of course, when I’m at the write-ins. Those outfits will be better than these. First, we have a blanket. That’s right. It’s November and it’s cold. I hate my radiator so I like to have it off. Which means I drink a lot of tea and dress like I’m living in an igloo. Then there’s last year’s NaNo shirt, which I bought after I won. Now, it’s my lucky writing shirt. And, on some nights, my nightgown. Also, a pair of lounge pants and a pair of pajama bottoms. 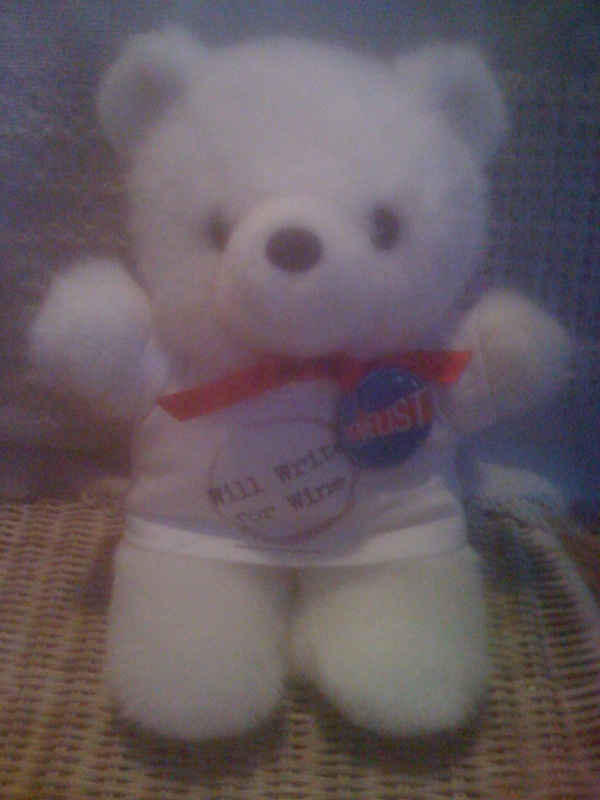 It’s my Will Write For Wine teddy bear, and he’s wearing the pin from my NaNoWriMo Noveling Kit. Poor guy doesn’t have a name. Any ideas? And there you have it. Fellow writers, what do you wear when you write? To those of you doing NaNo, best of luck! Happy word counts to all of you! I would think by the end of the month you might want a little help with the word count. Unless he deletes, then it’s bady puppy. I’ll be wearing my fingerless mittens for most of the month. The ones I just finished last night. I’ll probably also be wearing my shawl at the month progresses. Nothing like sitting infront of a window to make things cold. How did I miss your blog before this? Just found it today and I love the idea of blogging about your NaNo survival guide. In fact, I might steal the idea and post it on my blog. After all, work is slow today and I’m hyped up on sugar and nerves. I’m afraid I can’t help much with naming your Wiffer bear as I’m terrible at coming up with names. Perhaps something inspired by your favourite type of wine or winery? Cynthia — I saw the pics of your gloves. Very nice! Stay warm. . .
Jennifer — We should all be sharing NaNo survival tips! I love the idea of naming the bear after a wine. I don’t have much of it in the house. The one bottle I do have is from “Alfasi” wines. It’s Chilean, and really good. It’s a Cabernet. “Ca-Bear-Net.” Hmm. Very cheesy, but it could lead to something. 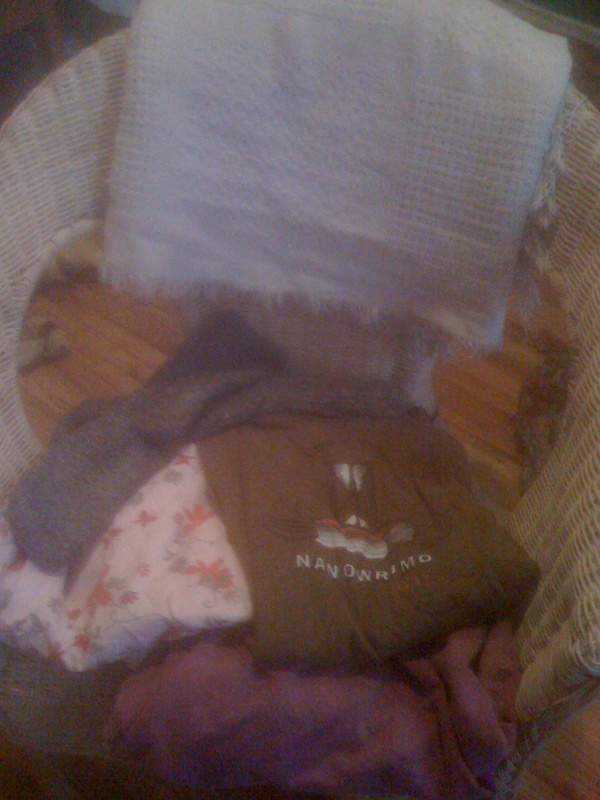 I’m trying to do NaNo, too…and I wear what I always wear–t-shirts or sweatshirts with stretchy pants. Yeah, I’m the height of fashion :). I’ve never made galatabouriko but my mother has. I’ll ask her if she still has the recipe. What part of Greece did you go to? Good luck w/ NaNo and thanks for stopping by! Love your NaNo wardrobe–makes all the difference, doesn’t it? The name for your bear deserves some careful consideration, so nothing yet, but he sure seems to be helping (judging by your word count.) Woot!!! Hey, how’d your pre-Nano queries go? I’m late to the blog… and since it appears you’re still taking requests – that lemon and rice soup? When we win, we can wear our feather boas out to lunch. Maybe you can locate a good store in NYC where we can pick up some tiaras to go with them? Wiffers walking around NYC in tiaras and feather boas! The soup is called avgo-lemeno (egg-lemon). I googled it and didn’t find any recipes I approved of, but you’re probably not as picky. My mom has a fabulous Greek cookbook. Trying to get her to scan and send some of the recipes. When she does, I’ll let you know. Pam, thanks for thinking about the bear’s name! I still can’t think of anything. My husband, who’s a world history teacher, and I were on the mainland for about 10 days touring the major cities and sites (you should’ve seen how excited he got when we were in the museum in Athens and he got to look at the Mask of Agammemon–spelling? ), and then we went on a 3-day cruise to visit the islands. I loved it ALL! 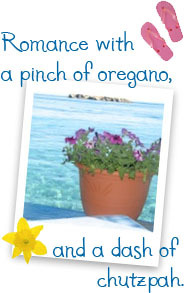 Actually, I’ve tried it before from recipes and haven’t found any I cared for as much as I had in Greece.